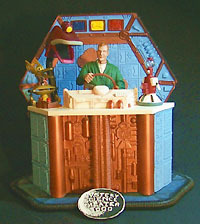 Kit review of Janus Company's MST3K . 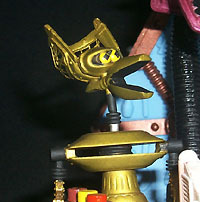 Mystery Science Theater 3000 was one of the brightest satellites in the cable television sky for over ten years. Unfortunately, the last original show ran in mid-1999 and the cast and crew have moved on to other things. 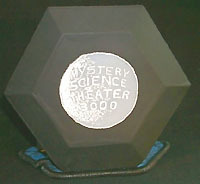 You can still own a small piece of the Satellite of Love in the form this 1/8 scale resin model, affectionately known as "Mystery Science Theater 3000: The Model Kit" (MST3K:TMK) from the Janus Company of Houston, Texas. 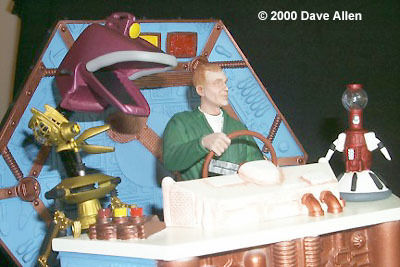 The kit portrays Mike Nelson, the reluctant commander of the SOL for the last half of the series, tightly gripping the steering wheel and confidently looking ahead while his robot friends Crow T. Robot, Tom Servo, and Gypsy look on in total abject fear. 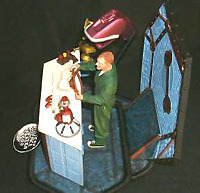 The finished model measures approximately 10 x 12 x 11 inches. The base and backdrop are somewhat stylized representations of the SOL set -- detail is crisp and the overall effect is very convincing. 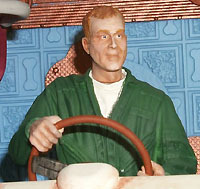 Fully licensed by Best Brains, Inc., the company that produced the show, this kit is amazingly accurate in part because sculptors Tom Seiler and Jeff Yagher traveled to the studio in Minnesota and personally measured the props. Nice work! The kit comes packaged in a sturdy box with excellent cover art by Gary Glover (also the author of a booklet on how to build your own life-size MST3K robots). The desk, or console, is hollow cast while almost everything else is solid resin. There are a couple of small styrene tubes for Gypsy's ears and Crow's neck. 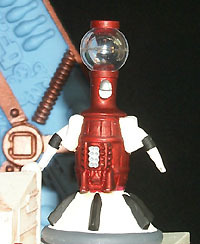 Tom Servo's noggin (a gumball machine in real life) is clear cast resin. Finally, the face cage on the lacrosse mask that forms part of Crow's head is photo-etched brass. The kit comes with one page of instructions with amusing contributions by Mike and the 'bots themselves. However, I highly recommend getting your hands on a copy of the Modeler's Resource magazine, Issue #31 (December 1999 /January 2000) which contains an excellent article by Cindy and Mike Morgan on the assembly and finishing of this kit. I followed their description almost to the letter and obtained excellent results. Assembling and finishing this kit was a blast. It is really about seven projects rather than one project, since each robot and set component requires a different treatment. I had the good fortune to meet the creative MST3K prop builders, Patrick Brantseg and Beez McKeever, a couple of years ago on the set of MST3K. They were both very nice people and very enthusiastic about their work. 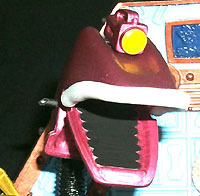 Since Patrick used Testors model paint on the 'bots, this is actually one model kit that you can paint using the same paint used on the real thing! MST3K:TMK is available through the MST3K Info Club (tell Barb I said "Hi!") or directly through Janus for around $200. This page copyright © 2000 Starship Modeler. Last updated on 8 February 2000.